This entry was posted on Sunday, August 29th, 2010 at 6:43 am	and is filed under Mafia II. You can follow any responses to this entry through the RSS 2.0 feed. You can leave a response, or trackback from your own site. Do you have something to repack sds ór do you only change things with hexeditor? OK it’s packed at bulk and you have to unpack it. Can you share some information how you repack? He uses a program he made himself to repack. Thanks but how you access the svn without username and password? http://svn.gib.me/public/mafia2/ etc. also not work. This mod is the BEST !!! Well done guys keep it up! I hope to update this mod! Thank you very much! I dowloaded the mode it is great but jimmys vendetta chapters are stuck on the loading except firs mission and tutorial. And jimmys head is black can you fix these please? There is nothing to fix, the leftover content in the game are broken and incomplete. So what we are going to do ? Wait till they throw a complete free ride patch or something ? Awesome mod. Whats with the “catch the escapee” thing outside of your house on free roam mode? You get into the blue car on the street and the red one takes off and you have to chase him? Whats that deal? Little buggy but nice. I’m trying to reset my L4D2 stats, but my weapons and other stuff won’t reset. I’ve tried to set all their values to 0, but it keeps coming up with this strange error. Wrong thread Freeze Dried Fish. Can I kindly ask for compiled version of SDS explorer? It looks like the best editing tool so far. Checkout the SVN properly, don’t just recursively download via HTTP. BIG thanks Rick, works like a charm so far. I am in Your debt ^_^. It contains deciphered meaning of some values in that table; it can come handy when modding this game to be less arcadey (I have toyed with recoil and inaccuracy multipliers, results are really pleasing). Feel free to use it when updating Gibbed.Illusion. And please, add save option for tables. Thank you very much in advance. I downloaded the file (size 4,41 mb). When I unziped it there is just 1 file: gui-main.sds. What have i done wrong? Hi, i want translate mafia II to persian, do you have tool for this? may i modify this mod of yours and redistribute it? i will put the apropriate credits and also keep your “watermark” on the maingame menu intact. However, when I click load chapter everything is blank? 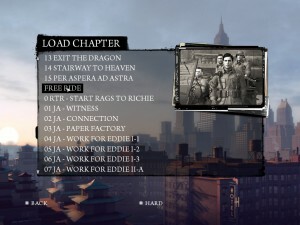 There are no missions to select from the load chapter menu? Everything is blank. The only thing I can click on is the level of difficulty option at the very bottom of the menu. Can someone please help me figure out how to get this working. As far as I know you only need gui-main.sds. am I missing a step? See youtube videos of this working for other people and it’s aggravating as all hell. This mod just makes Mafia 2 crash. Now I can’t play Mafia 2 at all. Before the loading screen, it crashes. Please help me. Respond ASAP. It work’s a little bit… i can see the load chapter thing but when i click there it is blank! PLZ help me someone!!! I downloaded this mod but if i press the load chapter its empty! how can y fix this? I downloaded this mod before but deleted it. Now i installed it again en its empty? Please help me the loader chapter is empty ! Same problem and looks like it isn’t getting fixed but posting cause i hope it will. Thank you so so so much.It’s very good mod. PROBLEM WITH MOD!!! 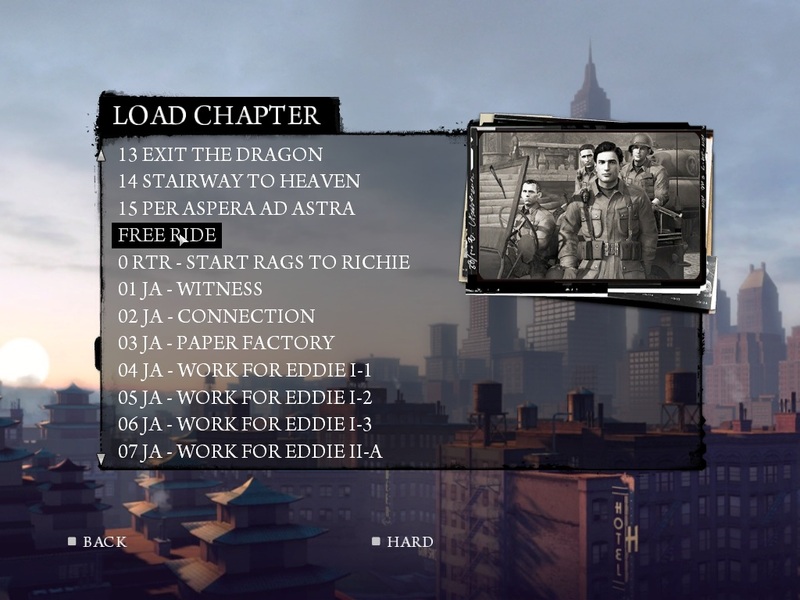 Hey man, whenever i open up the loadchapter menu in the mafia 2 menu, it is completely blank and there are no chapters. The one you get to through the menu>the story>load chapter is still good adn is perfect, but the ope from the mod is broken becasue when you open it up it is just completely blank with nothing at all. Please help!!!! it was made long time a go. that link doesn’t work for the DLC Folder Patch. Is it anywhere else online? I need your help with something. Mafia 2 .sds extractor programs have made. Please type the program will extract this file and will re-import. I’ve wanted to ask you if there is a chance that you can help us decrypting Mafia 3’s .SDS format. Encryption Method and Archive Structure has changed a bit.